ESA reports that its Earth-observing Sentinel-1A satellite was apparently hit by a space particle on Aug. 23. The tiny speck of space debris struck the spacecraft’s solar panel, causing a small power reduction and slight changes in Sentinel-1A’s orientation and orbit. According to ESA, controllers noticed that something was wrong at 1:07 p.m. EDT (17:07 GMT) on Aug. 23, when they detected a sudden small loss of power. In order to determine the cause of this anomaly, the engineers decided to turn on the spacecraft’s onboard cameras to check if everything is fine with solar arrays. 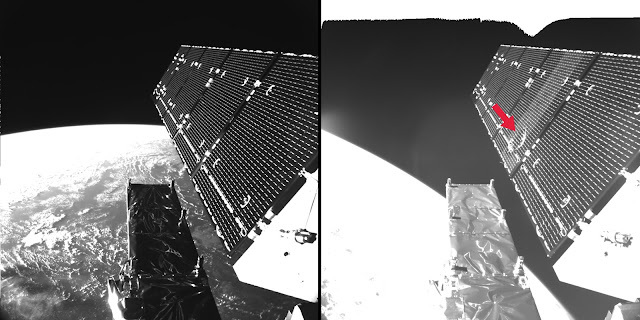 The pictures acquired by the cameras designed to monitor the deployment of the solar wings, allowed them to identify that something indeed has hit one of the two power-generating panels. They estimated that the impactor must have been few millimeters in diameter. “In this case, assuming the change in attitude and the orbit of the satellite at impact, the typical speed of such a fragment, plus additional parameters, our first estimates indicate that the size of the particle was of a few millimeters,” said Holger Krag, head of the Space Debris Office at ESA’s establishment in Darmstadt, Germany. He added that such small objects like the one that struck the solar array, are not trackable from the ground. Current technology allows controllers to detect only debris greater than about two inches which can be easily avoided in advance. ESA has not yet determined the origin of the object that hit its satellite. It could be a micrometeoroid or a tiny part of a spacecraft as well. “Analysis continues to obtain indications on whether the origin of the object was natural or man-made. The pictures of the affected area show a diameter of roughly 40 centimeters created on the solar array structure, confirming an impact from the back side, as suggested by the satellite’s attitude rate readings,” Krag noted. More than 500,000 pieces of space junk is currently floating around Earth, possessing threat to spacecraft and communications systems. In May this year, a tiny piece of space debris, possibly a paint flake or small metal fragment no bigger than a few thousandths of a millimeter across, struck one of the windows of the International Space Station. Although the last week hit affected the spacecraft’s onboard power and position, it did not interrupt the satellite’s routine operations, and according to ESA, the spacecraft continues its normal work. Launched on Apr. 3, 2014, Sentinel-1A is a polar-orbiting, all-weather, day-and-night radar imaging satellite for land and ocean services. It is one of the two Sentinel-1 spacecraft orbiting the Earth 180 degrees apart. The duo images the entire planet every six days. Sentinel satellites are part of the Copernicus program, funded jointly by the European Commission and ESA. The project uses accurate and timely data to provide key information services to improve the way the environment is managed, to help mitigate the effects of climate change, and to ensure civil security.